There are a number of courses currently being offered on the topic of bloodstain pattern analysis but few are offered by an instructor with as extensive a background in case work and forensic education as Paul Kish. To date Mr. Kish has educated over 1000 students from 18 countries during week-long Bloodstain Pattern Analysis Courses. His 27 years of case work definitely enhance the educational experience for his students. In addition to instructing week-long basic and advanced bloodstain courses, we are able to offer abbreviated courses and specialized courses designed to address the specific needs of crime laboratories, law enforcement agencies, coroner / medical examiner offices and attorneys. This week-long course is designed to give the attendees a unique opportunity to acquire first-hand knowledge of the bloodstain pattern analysis through lectures on theory and practical laboratory exercises. The purpose of the course is to provide a fundamental understanding of the underlying scientific principles related to bloodstain pattern analysis and their application to actual casework. Upon completion of this course, the participants will have acquired a basic understanding of how bloodstain pattern analysis will assist in their investigation of crimes scenes where blood has been shed. The course of instruction is designed for investigators, crime scene technicians, forensic scientists, attorneys, and medico-legal investigators. There are no minimum educational requirements for those who decide to attend this program. The courses offered by Paul Kish are not designed to make "instant experts" out of those in attendance. Rather our courses will give those in attendance a firm foundation in which they can build knowledge and qualifications. 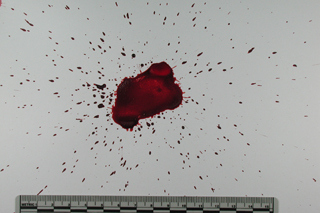 Understand the development, history, and advancement of bloodstain pattern analysis. Understand the inherent limitations of bloodstain pattern analysis. Be able to recognize, document, collect, preserve, and examine bloodstain pattern evidence. Understand the underlying scientific principles related to bloodstain pattern analysis. Understand how bloodstain pattern analysis interrelates to other forensic disciplines and information. Be able to recognize and interpret the mechanism by which basic bloodstain patterns are created. Have acquired first-hand knowledge of how blood reacts under various known conditions. Have an understanding of the mathematical relationships, which apply directly to bloodstain pattern analysis specifically, angle of impact determination(s), and three-dimensional determinations. Be acquainted with the practical aspects of bloodstain pattern analysis. Be capable of conducting a “basic” bloodstain pattern analysis.